Boy Scouts Considering Lifting Ban On Gay Scouts, Leaders : The Two-Way If approved, the new policy would allow local organizations to determine how they would address the issue. Just last summer, the national organization affirmed the ban. 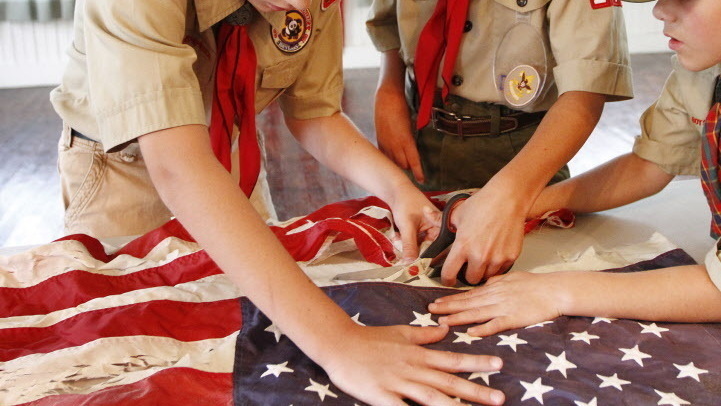 In Mississippi last month, scouts took part in a flag retirement ceremony. The Boy Scouts of America are considering lifting a national ban on gay scouts and leaders, the organizations spokesman announced. "If this policy shift is approved by the national board meeting at their scheduled meeting next week, it will be a sharp reversal of the Scouts' decade's old national policy banning homosexuals. "'The policy change under discussion would allow the religious, civic, or educational organizations that oversee and deliver Scouting to determine how to address this issue,' BSA spokesman Deron Smith said in a statement to USA TODAY." It was just in July of last year that the Scouts reaffirmed their ban on openly gay scouts and leaders. At the time, Scouts spokesman Deron Smith said the organization decided that was "absolutely the best policy." NBC News, which broke the story, says the Scouts are "close to ending ban on gay members, leaders." The network reports that by allowing each local organization to select their own policy it would also allow sponsors and parents "to choose a local unit which best meets the needs of their organization's mission, principles or religious beliefs." In a statement, GLAAD, the LGBT advocacy organization, welcomed the development. "The Boy Scouts of America have heard from scouts, corporations and millions of Americans that discriminating against gay scouts and scout leaders is wrong," GLAAD President Herndon Graddick said in a statement. Zach Wahls, Eagle Scout and founder of Scouts for Equality, said that the potential move would be "an incredible step forward in the right direction."